We read and share hundreds of messages and quotes about positive thinking and how they can change our lives altogether. Everyone has different notions, different definitions for the term ‘Positive Thinking’. Some consider it as a tool to get success, while some assume it to be genie to fulfill all their wishes. Are you too standing in the same queue with extreme positive mind hoping for a miraculous flip in your life when everything would change for good just because you are visualizing it? Each one of us always wants to look at the sunny side of life but you just can’t ignore the existence of its dark side. They are inseparable, like two sides of the same coin. If there has been an increase in “positive thinking” and ‘ I CAN’ attitude, you can’t deny the fact that there has been an increase in mental illness, depression, addiction, competition, and crime as well. Because there is more to positive thinking than merely thinking and visualizing every thing and circumstance as positive. Does that mean we have misinterpreted the concept of Positive thinking? YES. Because we are not realistic in our approach. 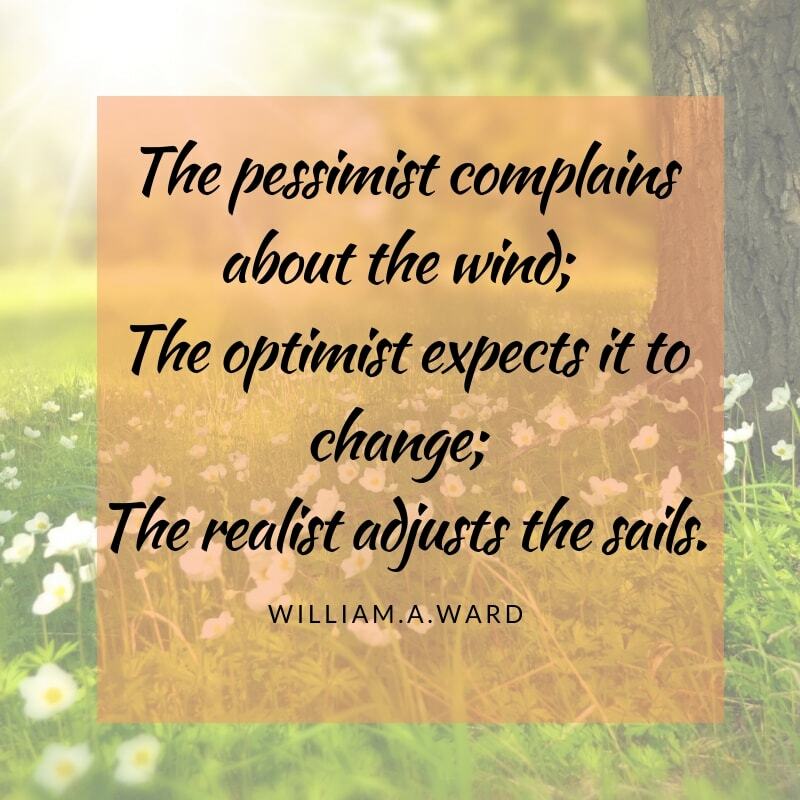 Optimistic thinking can undoubtedly pull you up from your blues or can instill you with life energy but there should be a limit as to save you from drowning in the unrealistic optimism. To understand the actual meaning of being positive or why am I stressing on the point that realistic positive thinking is better than positive thinking, you should know what is not positive thinking. If I keep on thinking about something which I want, I would get it. My future will not have any adverse situations. I don’t have this problem. I am alright. I will only think positive and ignore the negative thoughts altogether. My disease will be cured by the magical effect of positive thinking. If these are your thoughts, then it is certainly not called positive thinking. Yes, positive thinking can and will bring wonders in your life when it is associated with hard work and given a realistic approach. What is Realistic Positive Thinking? You should be matured enough to look at the circumstance life has tossed at you, the way it is. Ponder on its cause and consequence. If a situation is tough, first of all, accept the fact instead of being extremely positive and taking it as just a speckle. Analyze the situation from the unprejudiced lens, plan how you would act, jot down the obstacles set in this path and how many of these and to what extent could be removed. In a nutshell, see the problem in a realistic light. Yes, this problem has come. Now what? How should I deal with it? Let’s plan. Once you have accepted the fact and are all set with your strategy, you know how to deal positively with this adverse situation. You are bent on not losing your willpower and strength even if the situation goes completely against you. I hate to use the word ‘real’ positivity but just because of the prevalent misconception for the word ‘positive thinking’, I have to use it. Realistic positive thinking is, thus, accepting the fact, hoping for the best, working on the problem to make it null without ignoring the potential threats attached to it. To illustrate this point let’s look at an example of three students…. 3rd student says, “ I know I am good at studies, but this is the final exam. Many a times, I’ve heard that question paper of a particular subject has been set with difficult questions. It is better if I go through the syllabus once more to be assured of giving my best. Now, one can clearly understand by this example, the 1st student had a negative approach and the 2nd one was very optimistic, whereas the 3rd one had a balanced mind. He looked at the situation with a realistic approach, carefully considering all the aspects whether negative or positive and then proceeded with a positive attitude. A bit of negative emotions like –fear, nervousness, anxiety is good for better performance. These negative emotions prevent us from going haywire and alert us of potential threats so that we can cover it up with our practical approach and optimism. Studies have found that optimists were more prone to depression than the pessimists as a consequence of some negative event in life. For example: Failure in exam. Does it mean negative thoughts are better than optimistic thoughts? It just means that those so-called optimists wilfully did not look at the real picture of the life. Remember, Positive thinking can counter productivity if it ignores the warnings of the particular circumstance. Don’t you as an entrepreneur want to analyze the risk involved in a project and want to proceed with a correct attitude only after resolving the issue or after being fully equipped to handle the adversities? Same goes with every aspect of life. Extreme positive thinking may prove negative. Thus don’t plunge into extreme positive psychology where you don’t find the surface of realistic approach. This relentless promotion of ‘positive thinking’ without knowing or explaining the core value attached to it, will do more harm than good. Even a race has an achievable goal, a limit, and the participant knows how far their success point lies. He also knows about the hurdles which will come in between and also about the potential of his competitors who want to achieve the same goal. He has prepared hard to win the race and that is the reason behind his boosted energy and willpower. At the same time, he is aware of the fact that his competitors too have prepared equally hard and they are also here to give their best and win. In this situation, even if he does not win, he will not lose his heart because he knows he has given his best. He accepts the failure gracefully because he knows each individual’s capability vary. For him life and its opportunities doesn’t end here. There would be more chances for him to perform and win. Now imagine a contestant having extreme optimism about winning it. In his overconfidence, he has forgotten about his competitors and also did not practice as hard as he should have. Now if he fails, his confidence lost in this way will take a hell lot of time to revive. To conclude, Negative thinking narrows down our vision and focus whereas positive thinking opens up door to endless hopes, which usually makes us overconfident and prompts us to take more risk, eventually making us unhappy. What works in life is Realistic positivity lying between these two extreme mindsets. With its help, one can clearly look at both the sides and then takes his decision in the positive side carefully. One should have an upbeat attitude with feet firmly on the ground, mind totally alert of the facts, heart strong enough to accept any fate and courage inflamed to walk through any path. That is real positivity, or should I say, that is the true explanation of ‘being positive’. Do you have any instances or ideas to share about realistic optimism? Do you also feel that realistic positive thinking is better than positive thinking?